Is It Possible To Peanut Farm In Portland Oregon? Among John’s friends are two crows that calls us when their feeder is empty and an uppity squirrel that won’t take peanuts left on the outside table. He’s only interested in taking a peanut from John’s hand. Occasionally John fills his hand with five or six nuts so his squirrel can take his time turning them over, licking them and inspecting each one until he discovers which is the biggest. I keep suggesting that John buy raw peanuts because his squirrel plants all most all of them, and we’d soon have a peanut farm. My favorite John/animal interaction was when a small opossum sat beside John on the front steps. As the scruffy little guy ate cat food John pulled his tail. One essential in Outsider Art is surprise. When we frame a picture we’re labeling it as important. When we hang the picture up, the giant wall frames it again and the picture becomes even more important. If you live with a surprising picture- your life will change, not so much with a traditional, no surprise, picture of red barn on a hill. Some times we live with a picture all the years of childhood or for many adult years so let me ask you something; would you chose to live with or marry a person who is totally predictable who never surprises you? You’ve framed your picture twice it should move you differently every as you grow year by year. Last Sunday John and I spent four days and nights in a new resort- the VA hospital. John had pneumonia and I had John. I took one side trip and got an ultrasound and surprise I have breast cancer. Life is full of surprises and art can be too. nancymauerman. My plant buddy grew steadily until in mid summer. Then I finally did recognize my her. I had turned a tumble weed into a topiary! 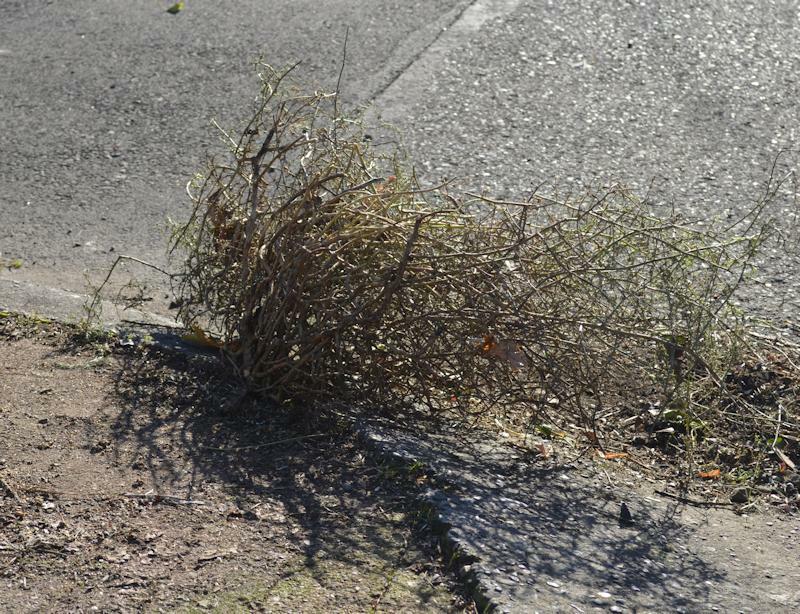 The picture below is my crescent shaped tumble weed all dried up ready to blow. Two days after the photo she let go of the ground and flew the coop. Just a side note to all my friends; I was with John a few days in the hospital. He has pneumonia. John sent home today to care for the animals. All of us here with hair, fur and feathers are waiting for him to come home. My Tabby-Bengal mix named Formica Dinnette Patrice Foxford Mauerman wants to know, do cats in Russia meow with an accent? We’ve had Russian neighbors with a baby. Their sweet little girl cried with an accent! Lines can be as stale as talk. A friend excitedly tells you a brilliant insight or idea he’s just had right there and there in front of you AND another time he recites a thought he’s regurgitated twenty six times before. Can you tell the difference? Can you tell the difference between a child making lines on a paper to represent a face AND a grown-up, who has made marks on paper for twenty years, and who tries to draw like a child, for let’s say an advertisement? We can tell a kid didn’t do it. The old guy’s lines are contrived. The muscles in his hand and arm repeat old movements just as they do in his handwriting. Many of the artists we find in art history books have collected children’s art for this freshness. We as adults love being with small children because we can see the world as NEW through their eyes and we’re delighted at the fresh word combinations they discover as they try to explain what they see. One of the lines in the picture below is tired, can you see which one? I’d say it’s the red circular line representing the outer eye on the left side of the page.